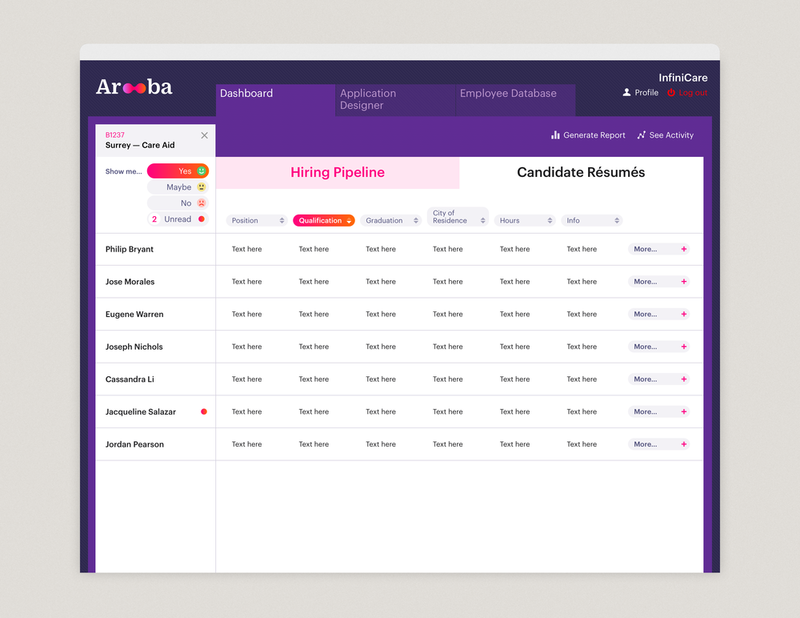 Arooba is an application built to streamline hiring, matchmaking, onboarding and HR tasks in the residential care space. While there are no shortage of generalized tools for these tasks, they’re all kind of clunky; the interfaces are messy, critical information is often concealed behind labyrinthine menus, and none address the unique needs of the healthcare industry. We set out to create an application powerful enough to automate the bulk of application & certification processes, but intuitive enough to quickly bring a new manager up to speed on their organization’s onboarding tasks. A toolset that demonstrated a clear hiring pipeline, and powerful matchmaking features to help healthcare professionals & organizations find the perfect fit — with all information accessible within three clicks. We audited dozens of tools, and extensively interviewed recruiters, managers & caregivers at all levels to identify the pain-points in their day-to-day processes. The end result is an elegantly designed ecosystem built from three components — the Recruiter Portal, the Applicant Portal, and the Posted Position. Our goal was a visual identity that felt energetic and friendly, avoiding the institutional palettes of hospice wards. Contemporary type, saturated colors and a mark referencing cellular mitosis formed the backbone of a visual language that felt tidy, competent and optimistic — like the best sort of caregiving environment. The Recruiter Portal allows employers to design custom applications, keep tabs on current employees & past temp workers, and to track the hiring pipeline of each position. Candidates are automatically added to each position's pipeline upon filling out an online application form. Clicking a position presents an overview of candidates, their attributes, and the status of their application. Upon creating a position through the Application Designer, the job position is added to a centralized database, allowing prospective employees to search for positions that meet their criteria (by region, hours, compensation, skill requirements, and many more). The Application Designer offers a number of pre-populated modules, as well as robust tools for customization. After creating a position through the Application Designer, the application can be filled out via a direct hyperlink, or the search tools in the Applicant Portal. The application process is designed to be as painless as possible, with visual indication of required field, instant feedback on completed modules, and fields that auto-fill from a prospective employee's resume — greatly reducing the tedium of filling out multiple applications. Healthcare professionals are able to upload their resume and certification details (to auto-fill all future application forms), search for positions that match their criteria, and recieve realtime information on their place in the hiring pipeline — eliminating the annoyance of follow-up communications.